Approximately half the world's population lacks access to essential health care. Where health care is accessible, it is often fragmented and of poor quality. Adopted with overwhelming support by Member States at the World Health Assembly in May 2016, the WHO Framework on integrated people-centred health services is a call for a fundamental shift in the way health services are funded, managed and delivered. It supports countries progress towards universal health coverage by shifting away from health systems designed around diseases and health institutions towards health systems designed for people. 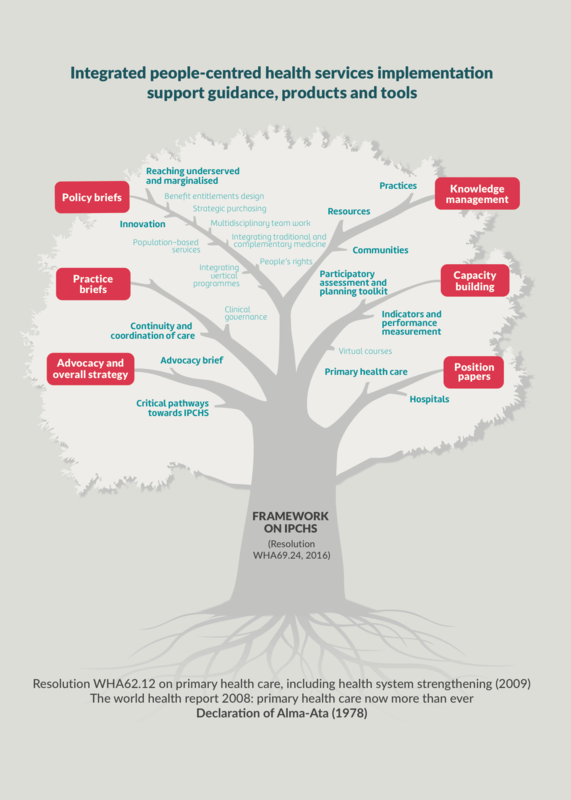 The Framework presents a compelling vision of a future in which all people have access to health services that are provided in a way that are coordinated around their needs, respects their preferences, and are safe, effective, timely, affordable, and of acceptable quality. Developed as a universal vision – the Framework can be adapted to all countries whether high, medium or low income, with mature or fragile health systems. Globally, more than 400 million people lack access to essential health care. Where health care is accessible, it is often fragmented and of poor quality. Adopted with overwhelming support by Member States at the World Health Assembly in May 2016, the WHO Framework on integrated people-centred health services is a call for a fundamental shift in the way health services are funded, managed and delivered. It supports countries progress towards universal health coverage by shifting away from health systems designed around diseases and health institutions towards health systems designed for people. WHO video: What is people-centred care? Advocating and partnering for change; consolidating evidence to build a case for IPHCS, demonstrating it works and identifying most promising policy options and interventions to implement IPHCS; building partnerships with international donors, UN agencies and civil societies, etc. Building momentum and fostering innovation; setting up networks and communities of practice, organizing twinning; providing easy access to key resources and case studies, through web-platform; and organizing international or national events. Preparing toolkits (i.e. repository of existing and newly developed tools) and providing support for their implementation for self-assessment of IPHCS. Providing technical assistance for demonstration projects at the sub-national level. Promoting and facilitating use of indicators for monitoring, evaluation and review of progress, contributing to efforts for development of indicators or data collection instruments in areas currently not adequately covered. Specifically, IPCHS implementation support encompasses guidance, products and tools, including advocacy material, strategy papers, position papers, policy and practice briefs, capacity-building toolkits, knowledge management platforms and technical assistance to countries. Below you can find a representation of the resources we are currently developing, along with the list of resources already available.